Upon the repeated requests of devotees of India and abroad, Bhagwan Shree Lakshmi Narayan Dham has prepared a CD by the name of Prabhu Kripa Naam Paath. 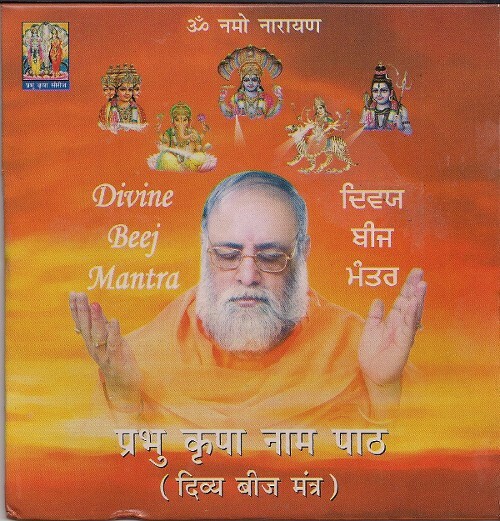 The CD has the revised and new procedure of divine Beej Mantras. Only those devotees, who have taken the new revised Beej Mantras from Param Pujya Sadgurudevji, are entitled to receive this CD. Divine Beej-Mantras (also called Cosmic Sound Secrets or Prabhu Kripa Naam Paath) can only be obtained in any Prabhu-Kripa Dukh Nivaran Samagam (Convention). These Conventions are being organized time to time at different places in the world. Any body interested in obtaining Cosmic Sound Secrets should attend any one of these conventions. Cosmic Sound Secrets (Beej-Mantras) are NOT provided over the phone or by email and are not broadcast on television, website etc. Schedule of these Conventions in all over the world is provided on this website as soon as available or may also be obtained from our website www.cosmicgrace.org or from Prabhu Kripa Magazine or by calling phone numbers provided on this website. Read complete book of Bhagwan Shree Ganpati Stotra Bhaskar. Else chant 2nd, 3rd, and 4th shalokas - 18 times of the Sankatnashnam Ganesh Stotram and complete the remaining shalokas only once. Chant the Gurumantra given to you by your Gurudev. If you have not made any Guru before, then start the Paath of divine Beej Mantras. Recite the ancient traditional science secrets i.e. Beej Manras. Perform Aarties: Bhagwan Ganpatiji, Shree Gurudevji's, Maa Mahalaxmiji, Bhagwan Shiv and Bhagwan Narayan. Important Note: The paath of Sri Guru Gita before the divine Paath of Beej Mantras is very beneficial and provides special grace.